The most difficult activities to regulate in our house are watching TV or movies and playing video games. What we can all do with our various screens nowadays is a wonder, but they are simply too seductive for the children. None of them enjoy reading, not the way that the parents enjoyed it.  But then we don't want to discourage computer literacy, because at a minimum their studies depend on it, and quite a few careers require at least some familiarity with computers. 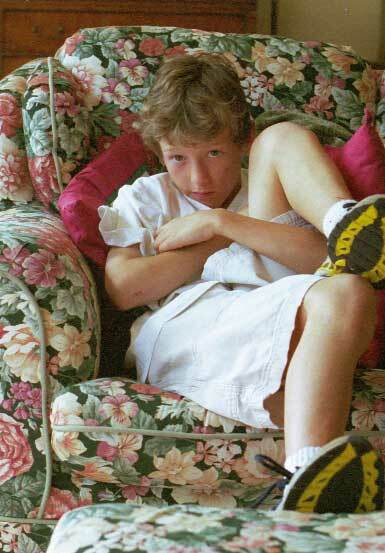 Nick began working, as in earning money, as a programmer not that long after graduating High School. So we have to permit, even encourage, computer usage. 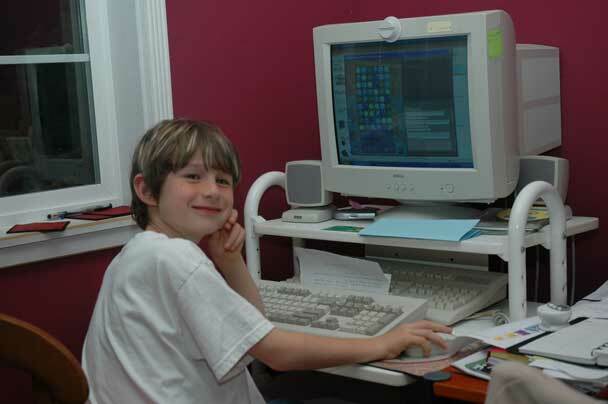 On the left is Charlie doing schoolwork on his mother's PC in 2003 before he was given one of his own. The problem with PCs is illustrated by the photo on the right. Video games can be played on computers. Not very well, actually. They tend to freeze mid-game, which is why there is such a strong market for video game systems designed just for playing games. But they do work for the simpler games, of the kind that Alex is playing here. Needless to say, modern PCs also double as DVD players, and the slippery slope has turned into a ski run. 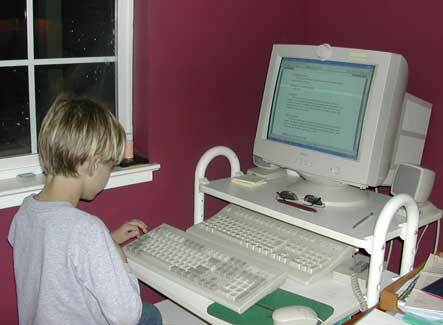 Dutiful parents can't neglect PCs, and thus effectively countenance video games and watching videos. We try to adjust. We did and do manage to ration the TV and video games at times. But they've never had enough, one way or another, and it's a constant battle. 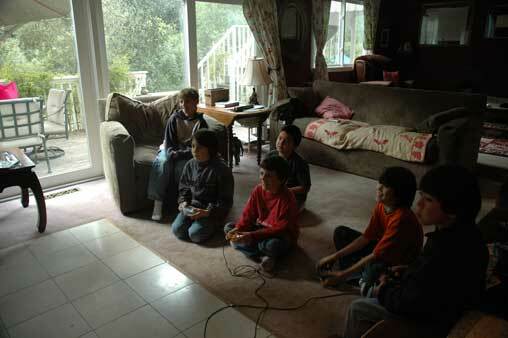 When the children's friends come over, the principal activity is often video games. 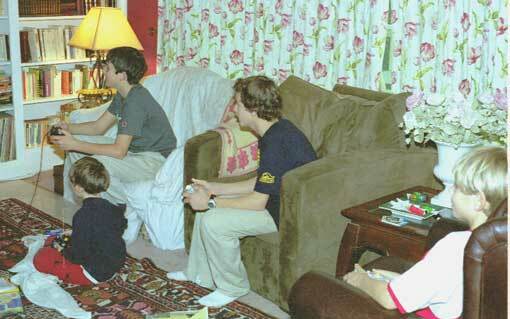 On the right, a group of Charlie's friends is immersed in the Game Cube in the living room in 2006. 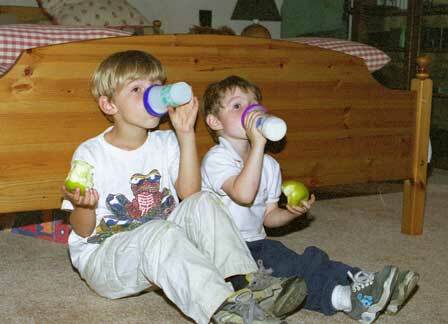 On the left, Tom and Alex on their Gameboys in 2003. 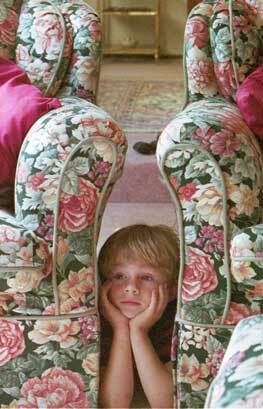 On the right, Charlie discretely lodged between two armchairs in 2001. 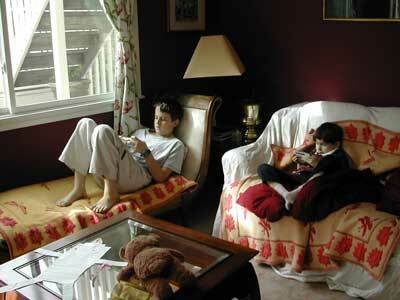 On the left, all four younger boys glued to the video game of the moment in 2004. We could go on, almost indefinitely! Here are other family hobbies, appearing on other pages: swimming, soccer, diving, surfing, homework, more soccer, trains, funfairs, mountain biking, stamping, more soccer.